A new volume in the Long Term Ecological Research (LTER) Book Series, Hemlock: A Forest Giant on the Edge, edited by Harvard Forest (HFR) LTER lead Principal Investigator David Foster and co-authored by seven HFR research colleagues, will be released in April by Yale University Press. 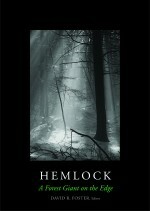 The book is geared toward a broad audience and blends more than a century of Harvard Forest research on hemlock forests and the invasive hemlock woolly adelgid, along with profiles of the people, experiments, and places central to that work. Excerpts of the book will be published this spring in Orion (foreword by journalist Robert Sullivan), Northern Woodlands (“The Pisgah Forest” by David Foster), Arnoldia, and Forest History Today. Spring events will include author presentations at the Northeast Natural History Conference, the Harvard Museum of Natural History, the University of Maine, and the Arnold Arboretum. An exhibit in the Harvard Forest Fisher Museum will feature photographs by Brooks Mathewson of wildlife associated with the eastern hemlock ecosystem. K-12 teachers involved in the Harvard Forest Schoolyard Ecology project, “Woolly Bully: The Invasive Pest, the Hemlock Woolly Adelgid,” will receive DVDs of a short video series created to accompany the book (also available on the book’s webpage: http://harvardforest.fas.harvard.edu/hemlock).